Can anyone else relate to these phases in a different context? I can see clearly how I have moved through these steps throughout my years of technology immersion and integration. My early entry into technology was not so bad. I had a little anxiety, but not generally with the tools themselves. My dad tended to have some cool tools around to try out, and then I worked at Radio Shack when I was in college. There was plenty of equipment to play with there, and if I messed it up, somebody would fix it. (Key thing to remember here: It can be fixed!) The neat thing now is that most schools have lots of technology tools for teachers to try out. Then the uncertainty sank in when I tried to figure out how to use these tools in the classroom. That is where my personal learning network kicked in with reading blogs written by other educators going through the same process of discovery (which is ongoing, by the way). Honestly, just reading what others were doing in their classrooms took me through the connections and the awareness stages. I learned how these tools tied to the learning my kids needed to do and realized which tools fit which need in my curriculum. No, it was not an overnight deal for me. It took reading and focusing on making myself a better teacher, but that is what makes a teacher better: being a lifelong learner. So the next logical step for me was presentation. In my version of this chart, that means I began implementing the ideas, the tools, and the structure of technology integration. Technology was still only a tool, but it became more than that to the kids. It was a hook to get them interested. It became a conduit to process information, connect with peers, and to publish their findings and creations. They were excited about learning English and literature. The technology tools had them hooked, and they made them better learners because of it. So how do I prove that? Well, through evaluation. Any educator worth his or her salt constantly monitors and evaluates what is working and what is not. If I cannot continually provide effective and affective instructional strategies, then I am not doing my job, and I am cheating the kids. Does all of this make sense? Maybe I am just writing it to get my thoughts out on how I made it through the process to where I am now. I am in a perpetual loop with this list, though. New tools come out, and I move to either the anxiety or the uncertainty stage and work my way forward. I cannot help that. It is the way I learn and develop. Our students go through these phases rather quickly with or without us. Are you on board? 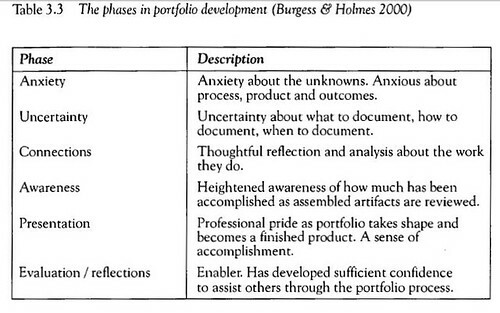 reference- Table from Developing Digital Portfolios for Childhood Education by Marja Kankaanranta. 2002. This entry was posted in Administration, Pedagogy, Teaching by woscholar. Bookmark the permalink.